Believe it or not, numerous kitchen gadgets can encourage you to eat healthier, achieve or maintain a healthy weight, and reduce chronic disease risks. Having the right equipment on hand makes preparing healthy meals and snacks easier and can even lead to a love for cooking! These top-8 kitchen gadgets make meal prep easier when following the Hallelujah Diet to reduce disease risks and stay healthy. 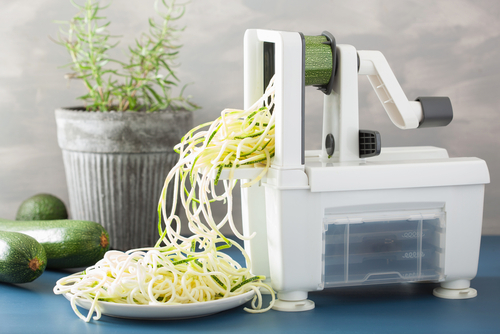 Instead of eating traditional pasta, use a spiral slicer to create vegetable noodles instead! Doing so can drastically reduce your intake of refined carbohydrates and boost the nutrient content of your favorite meals. Make zucchini spaghetti, other veggie noodles, potato twists, apple chips, coleslaw, gourmet salads, and much more. This handy kitchen gadget is made with high-quality stainless-steel blades, is easy to tear down, has self-contained storage, and is even dishwasher safe! Try this nutritious vegan zucchini pasta with puttanesca recipe to get started with your spiral slicer today. Nutrient-rich protein drinks and smoothies make excellent meal replacements or between-meal snacks and help meet your body’s daily nutritional needs. BPA-free personal blenders provide a variety of supplies needed to create numerous healthy foods and ingredients in the kitchen. You’ll receive a high-powered blender with four single-serving cups that are portable, versatile, and have powerful ice-crushing capabilities for making smoothies, grinding seeds, blending sauces, and many other functions. If you’re looking for nutritious, refreshing smoothie recipes, try Hallelujah Diet smoothie recipes or a breakfast power smoothie to give you a boost of energy all morning long. Drinking plant milks in place of dairy foods is an excellent way to keep disease risks low and consume plant protein, vitamins, and minerals abundant in nuts and seeds. With the Soyabella’s NutMilk Maker, you can create delicious raw cashew milk, almond milk, and other nut milks in just 30 seconds. You can also make rice milk, rice paste, porridge, and hot soups in as little as 15 minutes—and even mill grains or grind seeds! Soyabella’s NutMilk Maker contains advanced features that prevent dry heating, overflows, and overheating to enhance safety and reliability. Cleanup is simple. Try the Hallelujah Diet raw sweet almond milk recipe to get started toward a happier, healthier, disease-free life today! What better way to consume disease-fighting phytochemicals, enzymes, vitamins, and minerals than by juicing your own vegetables! Juicing removes indigestible fiber, so you’ll better absorb the nutrients your body craves. Use a NuWave slow juicer, which produces higher quality juice than traditional centrifugal juicers and retains vital nutrients that aren’t present in pasteurized, store-bought juices. You’ll experience a smooth consistency and a tasty, refreshing flavor when using the NuWave Juicer. 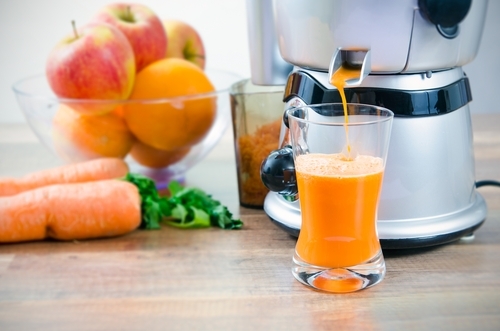 Simply turn on the machine, add all your favorite vegetable ingredients ( approximately 2/3 carrot and 1/3 greens), and let the juicer do all the work! Try Hallelujah Diet juice recipes to help you detox and gain a boost of energy like never before. 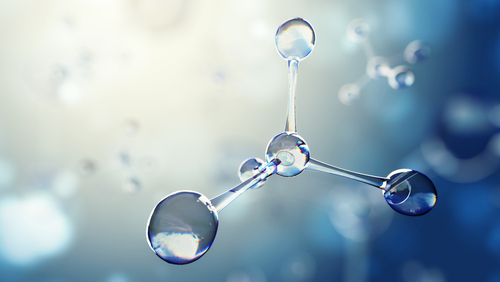 The benefits of probiotics are endless and include a strong immune system, protection against infections, and better digestion and absorption of essential nutrients. You can boost probiotics in your vegetables naturally with a vegetable fermenting kit. When using this kitchen gadget, you’ll add incredible flavor and probiotics to any favorite organic produce. Make pickles and pickled peppers, turnips, radishes, Brussels sprouts, and much more! Pickling your favorite veggies makes the vitamins and minerals in them more absorbable. Simply place raw vegetables of your choice in a canning jar, add water and salt, and mount the topper to experience your favorite produce transforming into flavorful, cultured veggies in no time. Try a sesame pickled cucumber recipe to get started. When you’re ready for a simple way to perfectly slice veggies without the muss and fuss of a knife and cutting board, consider a Mandolin slicer instead! You’ll create precise, uniform slices of carrots, cucumbers, potatoes, apples, and any other favorite produce. Simply slide the veggies or fruit along the stainless-steel runway and cut away! This kitchen gadget works perfectly for making fresh salads, potato wedges, veggie fries, and much more. Growing your own cereal grasses and sprouts is an easy way to get in your daily dose of vitamins, minerals, fiber, and antioxidants. You can grow wheatgrass and other nutritious grasses (and juice them), right in your own kitchen when using a FreshLife sprouter. The device operates indoors at room temperature, so you can grow fresh sprouts and grasses any time of year. It even contains its own sprinkling system and is easy to clean! 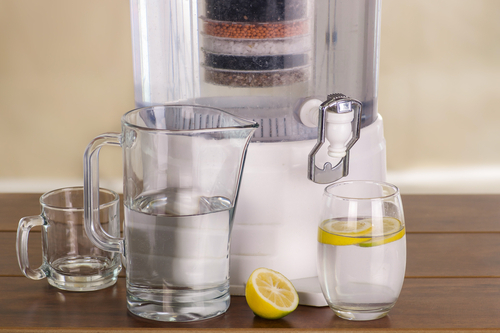 To enjoy the cleanest, purest water possible, use a WaterWise water distiller. This kitchen gadget is easy to use—just fill up the stainless-steel boiler with water from your tap, press a button, and enjoy toxin-free, refreshing water in no time. You can take water distillers with you when traveling, while camping, or to use in RVs, dorm rooms, and mobile homes. Getting and staying healthy has never been easier when you have the right kitchen gadgets in place to encourage healthy eating! Where can the NutMilk Maker video be found? Please provide a price list. Thanks. 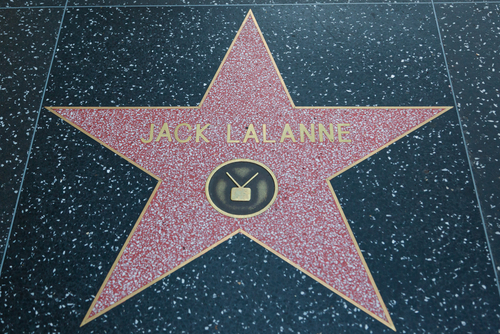 In each segment, there is green writing mentioning the product. If you click on that green writing, it will take you to that particular gadget on the HD shopping site. The pricing will be available there. One of the gadgets that HD does not sell is a seed grinder. I use ground flax seeds on a daily basis. This one by Epica (click Here to go to Amazon) has been fantastic for me. The HD recommends using Fiber Cleanse for the first several weeks on the Hallelujah Diet, then switching to either ground flax seeds or B-Flax-D. Ground flax seeds help to thicken smoothies and blended salads, so I use them frequently. Love this article. Very inspiring with lots of good ideas on eating healthier. When I am able to, I plan to buy many of the gadgets mentioned. My favorite kitchen gadget is the vegetable slicer. It is fun to turn zucchini into raw pasta. It is amazing how changing the form and texture helps to improve the taste of the zucchini. The zucchini pasta is good (raw or cooked) with a pasta or marinara sauce. I also like the nut milk maker for making almond milk. It makes the milk rich and creamy. My husband loves having different kitchen gadgets and it can be a motivation to keep a healthy diet. I love having different kitchen gadgets to use, it makes food prep and cooking so much more easier and fun!